It’s almost Hanukkah, can you believe it? Strangely, I can. This year seems to be flying by; sometimes I don’t know where the time went. All of a sudden it’s time to flip the calendar page to a new month! To be honest, I love the holiday season. And, after the year we have had, with so much harsh negativity, meanness and often tragedy, I welcome the chance to celebrate with my family and friends. Hanukkah is the perfect time to begin. What comes to mind when you think of Hanukkah? Is the story of the holiday, Antiochus, the Maccabees, the Festival of Lights? Maybe it’s the food: crunchy latkes, sweet sufganiyot and yummy chocolate gelt?. 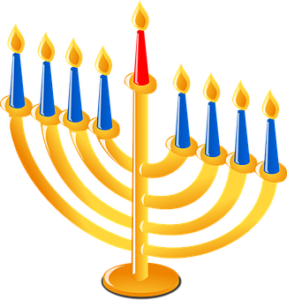 Perhaps it’s the joy of lighting the menorah, singing the prayer and watching the candlelight flicker for eight nights. I know, it’s playing dreidel for pennies or candy! Often its the presents; sharing the holiday through the exchange of gifts with family and friends. For me, well, it’s all of it. I love the story of the holiday; the miracle of the oil lasting eight whole nights. 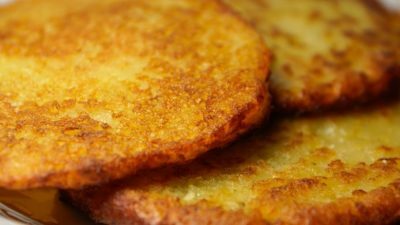 And, I CRAVE latkes; every year as soon as the holiday is in sight my mouth begins to water! Each year I incorporate the traditions of my past, some of which go back in time to my childhood AND I create new ones to share with my family, especially my most adorable grandson Jayden. He is older this year, and so much more aware. I cannot wait to share the holiday with him. The mere thought of it makes me smile. “Uh Oh!” I heard that collective sigh. No, I’m not going to encourage you not to give gifts this holiday. In fact, my idea for a “New Hanukkah” centers on gift giving. The gift of kindness. Has anyone seen the movie “Wonder”. There is a quote in the movie that says “When given the choice between being right or being kind, choose kind.” Wow, that’s pretty powerful; and inspiring. It moved me. Two words: “Be Kind”. Now, that’s my “New Hanukkah”. How about this for a new tradition, for each of the eight nights of Hanukkah, every member of your family commits to “doing” one random act of kindness. Think about it, there are so many things each of us can do. Do you have very young children? Encourage them to draw a picture for the grandparents, to clean up their room or to share their toys with a friends. Are you kids “school-aged”? Maybe they can thank a teacher who helped them, compliment someone in their class, sit with a lonely child at lunch. There are so many ways to be kind. As parents (and aunts and uncles and grandparents, etc) it is our responsibility to lead by example. So, buy the coffee for the person next to you line, ask the cashier at Publix how her day is going, and LISTEN to her answer, offer to help in your child’s class, hold the door for the person behind you! 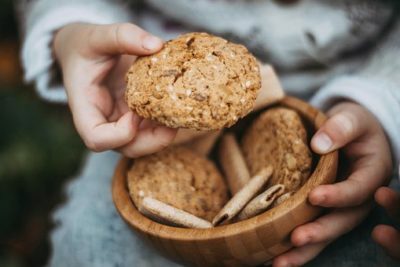 As a family, adopt a child for the holiday, bake cookies for the local fire department – or even the employees at your community guard gate, pick up trash you see in the street, you get the idea. Now, think about this. What if we each did something kind for eight days in a row. Maybe it would become a habit – and at least some of us would continue. And, if we shared our “New Hanukkah” perhaps others would join us. We could have lots of “New Hanukkahs” AND “New Christmases” AND “New New Years”! Hopefully some people would continue to choose kindness daily and together we could make our community a little bit better. Cantor Debbi Ballard, a fixture in the unafilliated Jewish community of south Florida, has over 13 years experience providing spiritual guidance, officiating at life cycle events and serving her community in many ways. Shema Koleinu serves all who wish to connect with their Jewish roots, through community, charity, and prayer, and provides acceptance and inclusion for all who seek it.